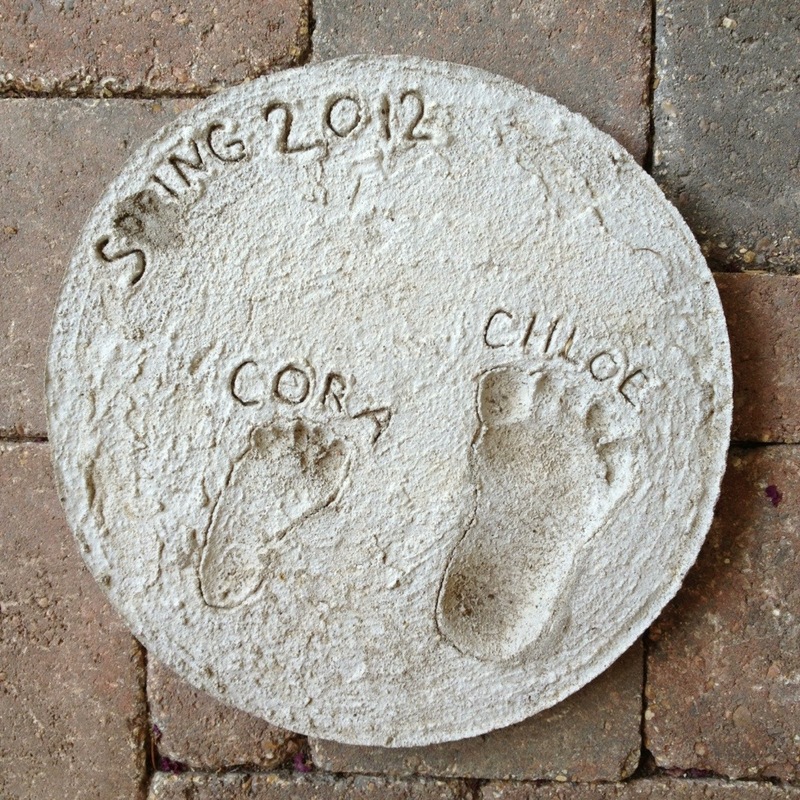 Home DIY	Our annual stepping stone project: a vast improvement over last year! 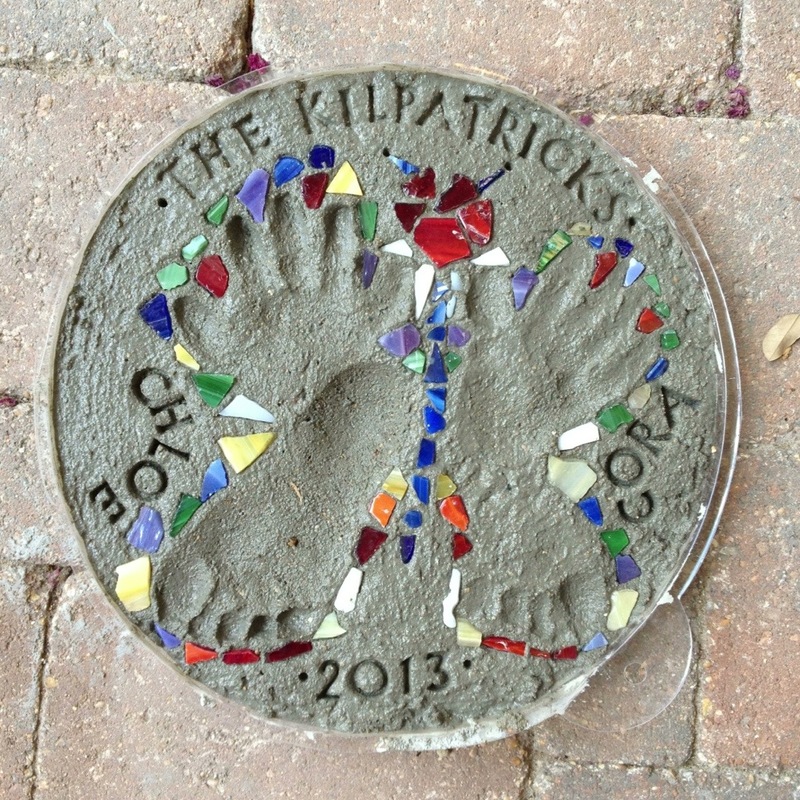 Our annual stepping stone project: a vast improvement over last year! We love getting to enjoy our backyard and garden and I also love documenting the girls’ lives since they only grow up once (and the history major in me loves to document & archive everything!). 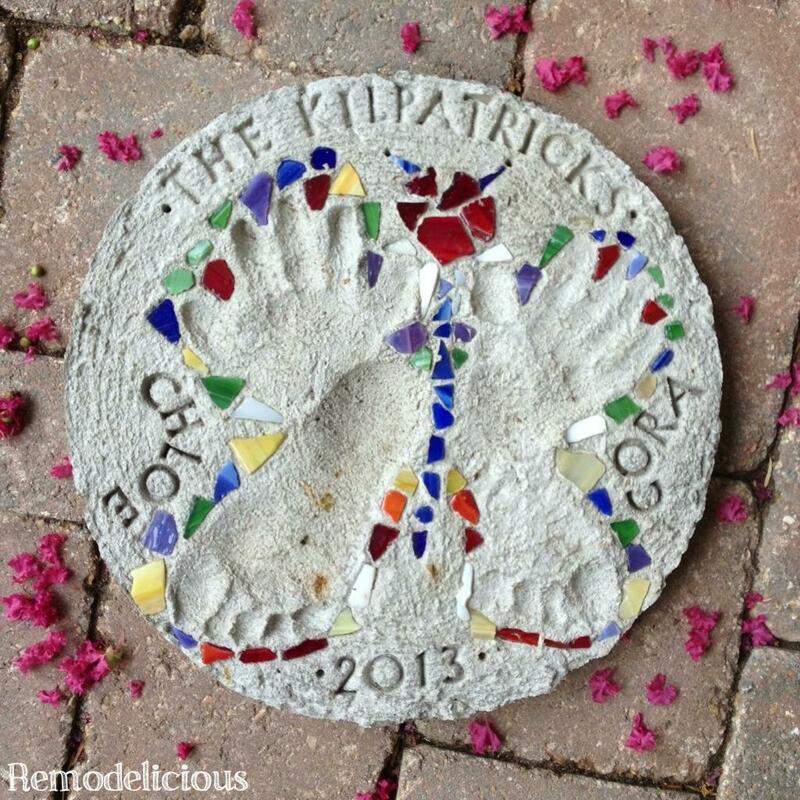 A tradition I wanted to start after receiving a stepping stone kit as a gift was to make at least one stepping stone every year to eventually create a path. The trouble was, the first year we were a family of 4 was a very trying one. With 2 under two, I had a daring toddler and colicky newborn/infant at the same time. If I’d had them in the opposite order, things would have been different, but we a 1-year old with no fear and a miserable newborn constantly in and out of the doctor trying to figure out why she couldn’t eat, sleep, or be merry. I did intent to re-do this project later in the year, but one thing lead to another and it never happened. Now we have a hideous stepping stone that is the perfect illustration of that moment in time when we were trying our hardest and barely hanging on. This year, I bought the same type of kit, only this one had stamps & glass bits included. This would have been fabulous last year when I was in over my head and a trip to the craft store might as well have been climbing Mt. Everest. While preparing the project, the girls were running around flapping their arms shouting “I’m a butterfly!”. Perfect inspiration! I love imprinting their hands and feet because it’s a great reminder for us all of how much they have truly grown. I picture us being able to walk down a path of these someday watching the footprints grow each year. On the same note, getting these footprints & handprints right is difficult. I learned last year that you have to push down harder than you think, and it’s best to let it set up just a it (20 minutes or so) before expecting it to hold a shape. This year, I learned that a daring 2.5 year old can push much harder than a delicate 1.5 year old. I love these imperfections because they are a great way of setting these little anecdotes in stone. I followed the included directions of this kit, (also available as a leaf, star, butterfly, flip flops, & much more), stamped our name across the top first so I’d know where the middle was, then had the girls press their hands and feet in (Cora first, then Chloe). I then sent them inside to play with daddy while I added the glass pieces around their imprints to form the butterfly and did the remaining stamps. The girls LOVED this project this year. Chloe especially. When it had dried a bit, I brought it in to show her the butterfly. She was so excited that she jumped up, gave me a hug, and said “thanks, ma!”. That made my day and I’m so glad that she is enjoying these projects now. She keeps putting her hand and foot into her butterfly wing, announcing “my foot!, my hand!”. They both also like to put their foot over their imprint from last year. Maybe we’ll do more than one a year, trying out the other shapes and letting the girls have a bit more control over “their own stone”. There’s no such thing as perfect with these. I can’t get the finish to be smooth, but in the garden they look great and are a piece of the joy that is making our home our own (plus, we can bring these with us next time we move! ).